After a much needed break from DIY, blogging, and basically lots of work we are finally back and ready to hit the ground running. I won’t go into all the details of why we were so spotty at posting new content in the last year but suffice to say that some major renovations (52 windows ya’ll! ), getting the yard basically tamed (bush hogged), and working/raising kids it was just time for a break. I can’t (always) speak for Adam, but I know that I was just kinda burnt out and trying to get quality posts together in the evenings just wasn’t happening, especially when there are chicken coops to build and plants to get in the ground. Just so much brush, even in the after shot! I’ve always had a pretty good running obsession for organic gardening. Not that I will snub all chemicals because I.Cant.Even. when it comes to poison ivy. But I have always figured if I could use less chemicals then that would be good. No chemicals would be even better! Adam has been feeding that obsession of mine with a series of permaculture books, a surprise registration to this years Organic Grower’s Conference (squeeeee! ), and unending patience as I listen and talk about podcast after podcast from Sow Edible Permaculture. 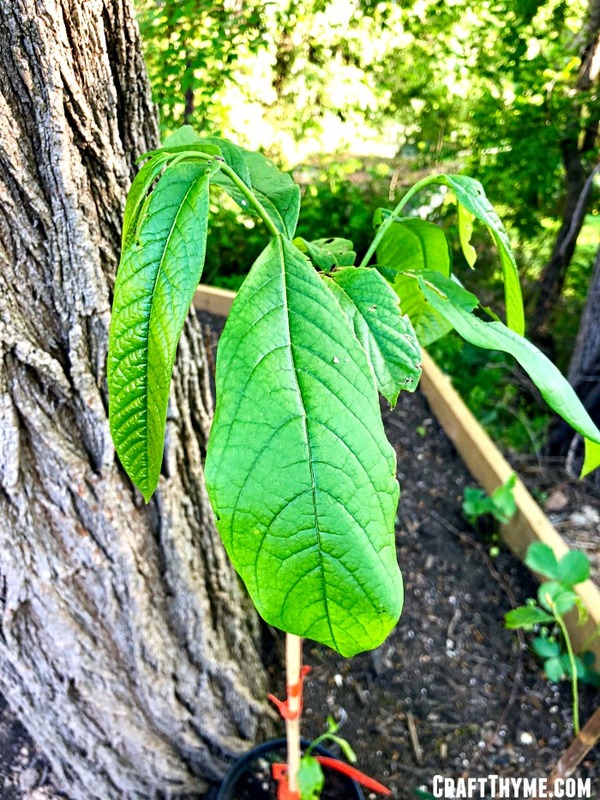 I/we want to take my gardening to the next level and design a whole yard system that works to create easy food, with no chemicals, for the whole family. Plus we got chickens! Who wouldn’t want to write about those lovely ladies?! You may recall the great bear, fox, and god knows what else attack on the previous flock when we moved into this house. 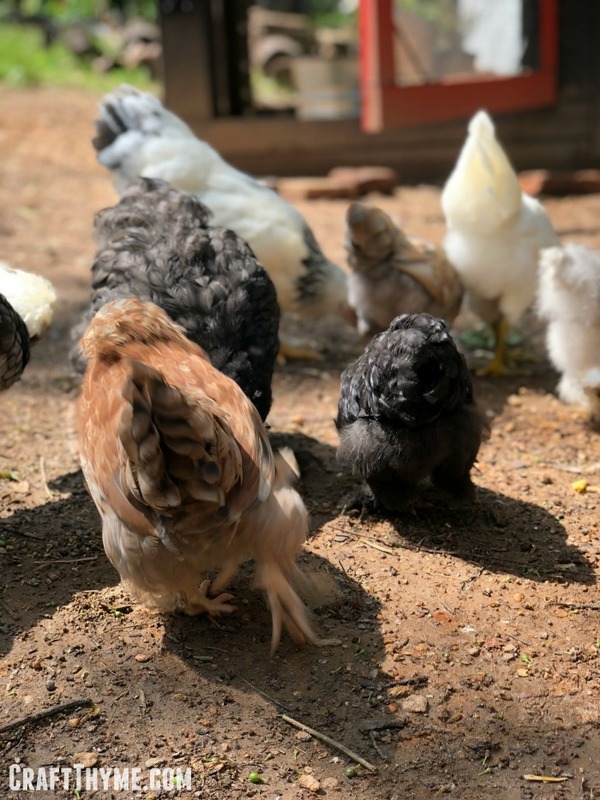 We have held off raising another flock until we could create a secure environment like we had at our industrial style house and it took quite a bit of time to build the taj ma-coop. So how does this turn into an urban permaculture plan? (How to create one is a topic for another post) Well, the long winded intro above was really to illustrate that while we have not been blogging, we have been reading, learning Sketchup, and drawing. And drawing. And drawing. I also took an online intro to permaculture (Adam listened to a lot of the videos). 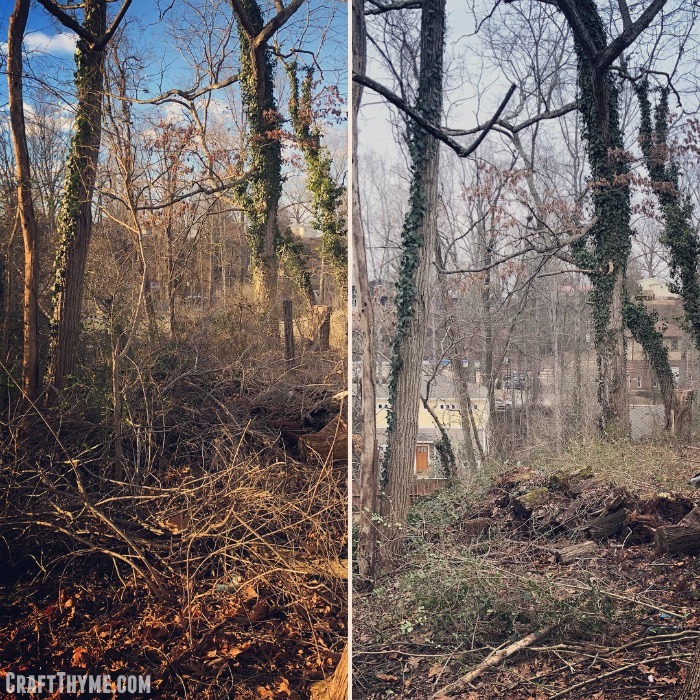 And even as we started clearing brush, we began more drawing… We actually ended up moving the coop location from an earlier plan. It was going to be tucked away behind the garage so we could get a clear view out of the back windows and utilize a difficult space. But once we started removing brush we realized it was waaaay too damp for chicken respiratory systems, but potentially perfect for elderberries, blueberries, hazel nuts, or mushroom logs. So my guess is that as we start working from the plan things will have to change further. Currently, we are working on the back corner area behind the garage. It was the original planned location of the chicken coop but now is going to have elderberries, hazelnuts, and other semi-shade plants. The chicken coop ended up just a little further down the property line in a drier area. It is also on the northern side of our property but far enough away from the house that the sun hits the front area. We accidentally planned a large sun-scoop (because sometimes I plan before I get through all my books, classes, and terminology) that has a chicken coop in the center. It is kinda nice to finally be in a gardening place where you just know how sun and plants interact enough that you can design something and then have your plan validated by experts. I’ve always wanted to have this little clearing edged into a mini-urban forest. The only change is that a central forest lounge area is going to be a chicken coop instead. This will allow the ladies wind protection, shade from the worst of the heat, but also, some good sunlight in the winter months to keep them warm. Here we are taking back the forest and making a path to the chicken coop that includes honey berries and nanking cherries. The plan as it stands is to clear out all the undergrowth, attack the english ivy/poison ivy/honeysuckle, and then replant the under story with a variety of perennial edibles. Currently, we are eyeballing the removal of some spindly wild cherries and replacement with a couple of pawpaws in the back and nice dwarf plum or persimmon in the front. Smaller berry bushes and canes, edible ferns, and wintergreen are also part of the foresty feel. When it is all said and done I think we will add loads of mulch and top with pretty pine straw mulch to speed up the forest vibe. It will take awhile for the canopy to evolve to fully shade the area. We had a lot of trees removed in the last year. My hope is between that and me removing all the invasive vines the grand oak at the end and the locusts, hickories, wild cherries and pears will fill in. These are great for feeding the wildlife and pollinating the small espalier orchard planned along the side. And while I say planning, what I mean is I have pawpaws in pots! Light is probably the hardest part of the entire urban permaculture plan. We are urban and urban = neighbors trees and buildings blocking the light. To get enough light to fuel fruit production I really only have a singular location. I can slot in trees on the other side of the house in a few places but mostly this section is it. We are slightly down slope from the ridge and the neighbors across the street have some large trees that cut down on available sunlight. Additionally, I am kinda just attached to the weeping cherry in the front and the 100+ year old cherry on the other side. So I just have to carefully plan the sun loving crops up front and the shade tolerant items elsewhere. On that note the espalier fruit trees are in front of a wicked new composting fence we just wrapped. It will also make a nice break between us and the renters next door. We already added tons of raised beds along the driveways and in front of the cherry tree. You might note there is this large square thing in the yard. It is this ridiculously large concrete pad that housed a gazebo and large hot tub. The gazebo was gone when we moved in and the hot tub had a large crack in it. We ended up finding someone to take it for parts but we were left with a giant pad… On that note we saved all the serviceable old windows when we got them replaced last fall in the hopes of building a greenhouse. We opted to save those and look at making a semi-passive solar greenhouse in that place instead. With the removal of some trees this now looks like a decent place to build a greenhouse. Maybe not perfection but with the existing structures it is one of the better places. More over it will act as a wind break for the chicken coop when we do finally get it installed. The front section will eventually house a number of smaller herbs, flowers, and perennial veggies. It already has a beautiful Japanese Maple we managed to salvage after being covered with other trees for years. 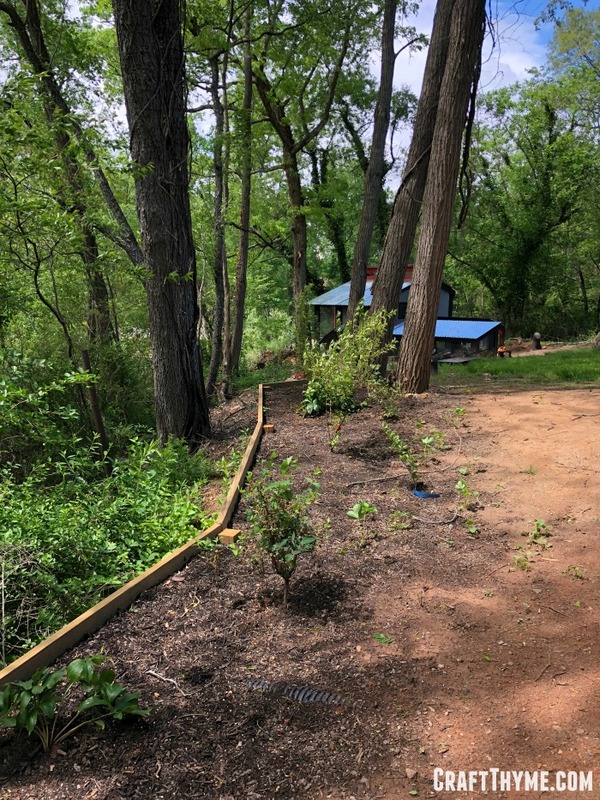 We also planted two more ornamental trees, a weeping gingko, and a japonicum maple because as much as we love edible plants we also love beautiful plants. Around these we are going to cut in some new sidewalks to repair the broken ones with pavers. Adam has already prepped the site for the bricks and I started adding perennials from a local grower, Kenny’s Perrenials. On the other side we started on the tiered garden beds last year and still plan to finish those. They won’t get a ton of light due the the trees across the street, but I think the top two tiers could be a great place for blue berries and maybe an asparagus bed. We moved a play area/patio section over here so that if we ever fully fix the pond and create a waterfall we will be able to enjoy them. It also keeps us from having negotiate with the neighbors on removing a bunch of white pines. At the top point of my lot I’ll probably leave that scrub for the next few years, but I can probably manage to fit in a couple more fruit trees or some chestnut hybrids along the road. It will save the kiddos stepping on the chestnut burrs and allows me to expand what our yard has to offer. Plus I just happen to love chestnuts. The slope by the garage is kinda useless as-is, but I think that we can quickly get some use out of it by letting squash and pumpkins trail down the hill and planting Jerusalem artichokes at the bottom. I dug a tiny swale midway down and planted corn below the squash layer. Long term we could put in more raised tiered beds, but it really only gets great sun at the top. So maybe frame out a top bed and then plant trailing items that take up a ton of garden space. We have some issues with the water drainage; in that everything slopes to the back which still leaves the front beds without adequate rainfall at times. While permaculture, in a perfect world, works without a lot of human intervention and irrigation this urban lot may just have to have some rain barrels up front to supplement from time to time. We are not willing to sacrifice aesthetics and create a berm in the lawn to keep all the water on the lot. We’re hoping to make the urban permaculture plan as good looking as possible while still being as permaculture as possible. It might be snubbed by permaculture enthusiasts, but I hope to make something beautiful that might serve as a potential show piece to other people who are interested in dabbling in the urban homesteading/permaculture concepts. For example, I hope to make a solar powered waterfall for the kids. It will serve little purpose other than being my garden folly and to attract wildlife! Another issue with the plan is that most of the nitrogen creation by the chickens is going to be at the back of the lot. Since we have a small lot (1/3 of an acre) I’m okay with the extra work it will take to move the site made fertilizer (aka composted poop) upwards in the garden. I’m already moving the rabbit poop downwards ;). Since we are going to have to move the poop we plan on two different composting areas one behind the chicken coop for cold compost where we add to it slowly. By the eventual greenhouse we plan on a three bin system that will run hot compost in the fall/winter to try and use the compost as a method to warm the thermal mass of the concrete. Finally this entire plan is NOT a year in the making. Here is what we hope to accomplish on major projects. It leaves out small things like rain barrels, drip irrigation etc. Year 4 & 5 TBD but probably some major indoor kitchen renovations if we haven’t gotten to all of that in year 3! So we start with a plan and we modify it as we go. Can’t wait to see how it turns out and we are really hoping you follow along. We use our Instagram and Facebook Stories to show the day to day urban-farm work. 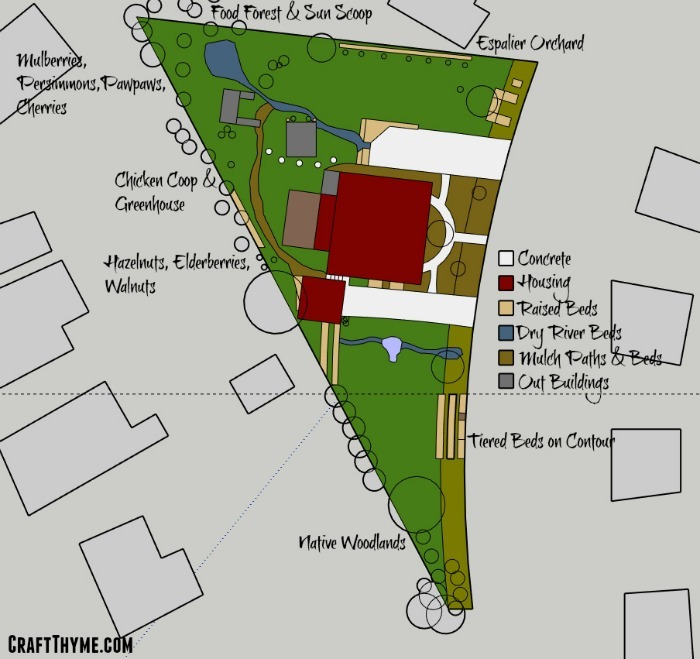 We hope you will follow our progress on the urban permaculture plan and learn to create your own permaculture oasis.